The word “gazelle” could be derived from the Arabic ghazăl. The first Latin language to adopt it was Middle French, and the word entered the English language around 1600 from the French. Arab people traditionally hunted the gazelle. Appreciated for its grace, it is a symbol most commonly associated in Arabic literature with female beauty. One of the traditional themes of Arabic love poetry involves comparing the gazelle with the beloved, and linguists theorize that ghazăl, the word for love poetry in Arabic, is related to the word for gazelle. The dama gazelle lives in the Sahara desert and the Sahel. This critically endangered species has disappeared from most of its former range due to overhunting and habitat loss, and natural populations only remain in Chad, Mali, and Niger. The dama gazelle is white with a tannish-brown head and neck. The gazelles’ heads are small with narrow muzzles, their eyes are relatively large, and they have longer necks and legs than most gazelles. 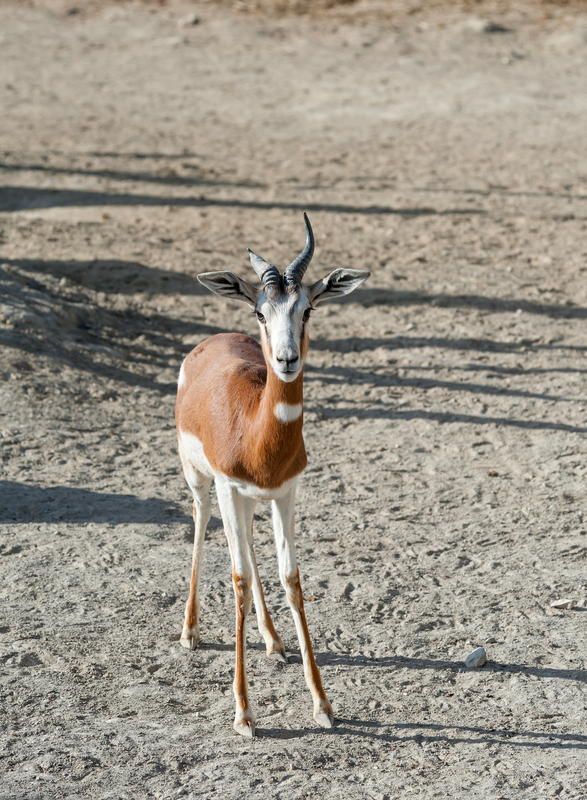 Damas are considered the largest type of gazelle, with incredibly long legs, which provide extra surface area on their bodies to dissipate heat, one of the many ways they stay cool in their hot desert environment. They also tend to need more water than some of their desert relatives, but they can withstand fairly long periods of drought. Unlike many other desert mammals, damas are a diurnal species, meaning they are active during the day.